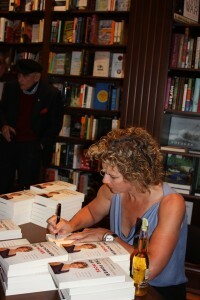 Signing books at my book launch. Yes that's a Corona by my side and yes - that is Cdn author, Peter C Newman waiting for his! For me- it was a very special night. Not just because my book was actually real and being sold but because so many people came to show their support for me. People from so many different corners of my life; my partner, our families, friends from rowing, university, my GirlImpact trip to Africa, the Toronto 2008 Olympic Bid, my Tuscany trips, other Olympians and journalists – who came not to work, but as my friends, and so many others. The plan was to begin greeting people at 5pm and then at around 6:30 I would address the group after that I’d sign books. Corona (Thank you Courtney and CoronaExtra!! ), wine and some hors d’oeuvres would be served – I wanted this to be a celebration! As people began to arrive, all my worlds were colliding! I felt as if I was a dog in a squirrel park! I didn’t know where to focus. How was I to keep everyone happy? Ben McNally, the book store owner, had warned that once I sat at the autograph table I would be stuck there – with no chance left to wander and gab through the crowd. Turns out – that was the perfect thing for me – at the table I only had one person to focus on and that was who ever it was who handed me a book! I acknowledged a few special people who had come. My parents of course, and Deanah’s parents as well as her sister-in-law and her adorable two nieces. I thanked my aunt and uncle for coming from Vancouver. (It was their 50th anniversary but I was sworn to not make a big deal of it – Happy Anniversary Woody and Sherrill!). Peter C Newman and his wife had come, he’s written 24 books and sold over 2 million copies. I said I’d be happy with a mere million. I got a raised eyebrow and a laugh in return. Brian Williams was there; he’s the legendary canadian broadcaster – he’s covered 13 Olympic Games and I will have the privilege of working with him this summer at the London 2012 Games where I’ll be a Studio Analyst. I thanked Greystone Books for taking a leap of faith and publishing my book, my friend Chris Cook for providing me with some much needed writers accountability and Kathleen Heddle and Al Morrow for being my major character builders (some books have characters… mine has my character builders. Everyone who came was generous with their time, and even more so as they bought books and lined up to have them signed. Apparently I ‘fail’ when it comes through keeping the line going… because I loved saying hello and trying to write a little something of significance in each one. My focus settled on each person as they came to me and I was do thankful to each one. If that’s a fail though… give me all F’s! 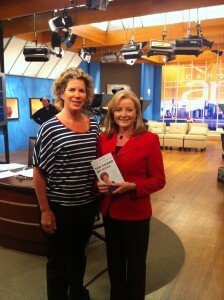 with Bev Thomson after the Power of More's tv debut! The next morning PR for the book went into full swing. Canada AM, Breakfast Television (in Toronto, Winnipeg, Edmonton and Calgary – Thanks BT!! ), NewsTalk 1010, the Fan590 with McCowan and Brunt – everyone has been so great and I’ve been loving chatting about the journey of writing my book and all the thoughts and ideas that went into creating the Power of More. (All of which leads me to be almost grateful that the original title didn’t stick. I had thought of “The Jammed Cat Theory of Performance” – but explaining that would have taken up every interview minute I’ve been given! If you’re curious… the explanation is in the book – and there is even a video if you go to the page link above for The Book) ! This entry was posted in Marnie's Adventures and tagged Power of More by Marnie. Bookmark the permalink.